VIEW: Panoramic 5th floor views of ocean and outer islands of Molokini, Kahoolawe, and Lanai enhanced by a full wall of ceiling to floor windows. Back door view to slopes of Haleakala. Canadian owned. Sister condo to D 614. Vacation with friends and family. Please ask if your preferred dates seem to be taken. Private management allows for flexibility and personal service. LANAI: New, bistro-style chairs for gorgeous view over lanai railing. Dine outside or watch the sunset from your lanai with a cool drink. Also club chairs and table for relaxing. LOCATION: Condo is located on south end of 5th floor of preferred D building. Quiet unit away from foot traffic. Non-smoking unit. Smoking area available outdoors at north end of complex. Two elevators, Numbered parking space immediately adjacent to building. New split air conditioning to both living room and bedroom. Unit also gets ocean breezes through lanai screens and mountain breezes through front door screen. Two ceiling fans. Roll Down Sun Shade on lanai allows the view but cools the lanai 10 degrees. A tropical paradise! KITCHEN: Dishwasher/ Disposal, Microwave, Fridge with Ice Dispenser, Blender, Coffee Maker & French Press, Waffle Maker, Complete set of pots, pans, dishes, etc. Island cookbook for local dishes. LIVING/DINING AREA: HDTV/DVD, iphone / ipod speaker, Binoculars to watch whales (in season), Ceiling fan, Current Guide books to Maui for touring, hiking and snorkeling. BEDROOM: Queen size bed with 400 thread count linens and comfortable mattress with pillow top, ceiling fan, mirrored walls, Hula implements. BEACH EQUIPMENT: Tommy Bahama Beach Chairs, Beach Umbrella, Beach Towels, Beach Mats, Floats with air pump, Pool Noodles, Cooler, Boogie Boards (use at your own risk). ELECTRONIC KEYLESS ENTRY has been installed for your convenience and safety. No keys to worry about at the beach. OTHER: Iron and Ironing board, new vacuum, brooms, etc. Maid service can be arranged. ACTIVITY RESERVATION CENTER on the premise available to book tours, luaus, etc. On-island manager. LOCATION: Kihei Akahi, one of Kihei's favorite vacation resort complexes, is on six and a half acres of beautiful lush tropical grounds, with two swimming pools, BBQ's, and a tennis court and pickleboard court (rackets in office). Kihei Akahi is across the street from Kamaole Beach Park II, a great beach for sunbathing, walking, swimming, snorkeling, boogie boarding, and whale watching (in season), and within walking distance of several of Maui's most popular beaches. Steps away from several small shopping centers with a variety of shopping and dining options. Wailea and Makena are a short drive, with some of Maui's best golf courses and the 'Shops of Wailea'. We first set foot on Maui as young honeymooners when we hiked across Haleakala and camped. We have been frequent visitors to Maui every since. Hubby and I dreamt of a sunny getaway to escape the Pacific west coast rain for decades. And whenever we returned to Maui, it felt like home. We wanted a place in friendly Kihei, within walking distance to shops and restaurants, a stone's throw away from a beautiful beach. Nothing felt right until we opened the door to D514 and saw that amazing view. We renovated with Hawaiian landscape and culture in mind: bamboo cupboards, Hawaiian artwork, and mirrors to bring the outside in. A final touch was the conch shell to blow at sunset and the dried pineapple art box on the kitchen wall, a symbol of hospitality. Now we share our love of Maui and Kihei with family, friends and new and returning guests near and far. In 2018, we bought our sister condo D614 to accommodate more guests as well as couples and families who want to travel together, but have the privacy of their own place. Guests return year after year for the personalized and complete comforts of a 'second home'. Absolutely clean and stocked with everything you could need for a beach vacation. Just unpack, get some groceries and begin enjoying a setting with a real Aloha feeling. Ocean view: 180 degree view from Molokini to West Maui Mountains. Binoculars to watch whales (in season). Free local calls and long distance to US and Canada. Telephone with answering machine. In unit washer and dryer with some detergent provided. New bamboo cupboards, granite countertop. Kayak and stand up paddleboard rental facility within walking distance. Some snorkelling gear in condo ( may not fit everyone) and rental facility within walking distance. Recently resurfaced tennis and pickle ball court. Tile floors, ramp to 2 elevator. Complex has accessible parking space very close to beach. Shower chair available - please ask. 2 pools with BBQ's and picnic area. Coolers with ice cold packs in freezer. 2 min walk from door to beautiful Kamaole Beach II with lifeguard. Safe cross walk to beach. Keyless entry lock with personal code so you never have to worry about losing your key. Beach chairs, beach mats, umbrella, boogie boards, skim board, sand toys, coolers, yoga mat A roll down lanai sun screen cools the lanai and condo by 10 degrees while preserving the sensational view. Lovely location in beautifu Kihei! 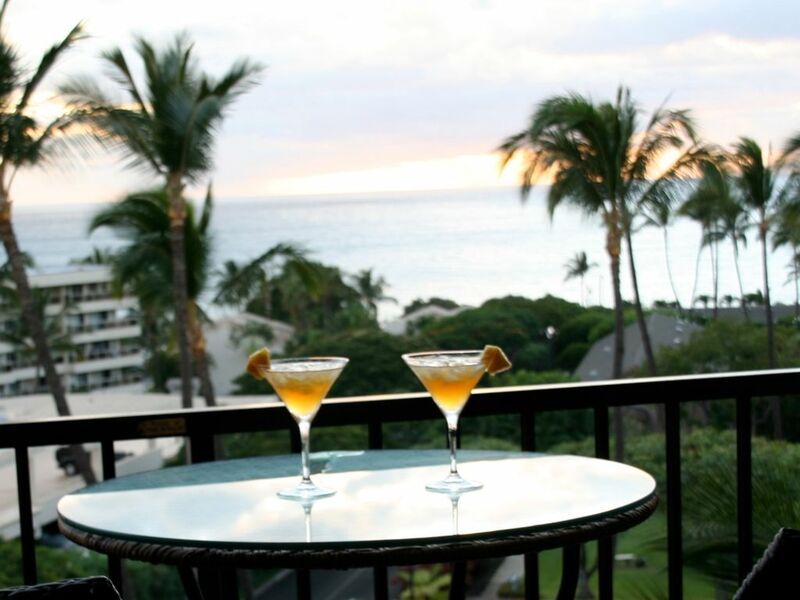 Picture yourself sipping drinks on a beautiful lanai overlooking the ocean at sunset in Kihei, Maui. We loved our stay and the “historic” storm was an adventure. Convenient location, nice view and nicely appointed condo. Amazing Vacation Condo; Gracious Owner! We really enjoyed our 16 day vacation holiday in D514. The communication with Diane made for a worry free booking from start to finish. We appreciated the welcoming gift and the convenience of the listed amenities. The kitchen was well stocked and the bed comfortable. Although no AC, the breeze from the fans kept us extremely comfortable. We loved the location and easy access to parks, beaches, restaurants, shopping etc.. We were most impressed with the spectacular sunset views from the lanai. In summary, my wife and I highly recommend this condo rental. Thanks so much. We had a wonderful time at your condo in Maui. Even though it was very hot outside, we opened the back door and let the breeze blow through. Who needs air conditioning? We prefer the natural method and use the fan and the breeze to cool us. The suite is well equipped with all the conveniences and the lanai is just perfect for cocktails and sunsets. The property itself is very well managed and maintained. We BBQ'd at the pool almost every day. Thanks for all the beach supplies as well. We enjoyed many days swimming in the surf and reading on the beach. We'll definitely be back. Nice view but it was very humid and hot and no A/C. We had to buy a box fan for the unit to make it bearable. Nice location right across the street from the beach. I am sorry to hear that you were uncomfortable and I wish I had known during your stay. I do try to make contact with each guest on arrival and ask guests to let me know if there are any issues, but in your case, we never could connect. We have 2 table fans in the closet, so it was unnecessary for you to purchase your own. Additionally, we have a sun shade on the lanai that lowers the internal temperature by 10 degrees while preserving the view. Some guests are unaware it is there, although I do try to highlight it in the welcome notes. Canadian owner. Please inquire about preferred exchange rate.